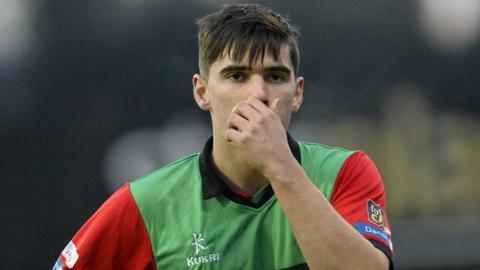 Jimmy Callacher appears to have played his last game for Glentoran after the club indicated that he had "refused the offer of a new, improved contract". Linfield are understood to be one of the clubs interested in signing the player, who has been part of the Oval set-up since the age of 12. The Glens say that they have received a formal, written request from Linfield to speak to the player in January. The East Belfast club add that they will be expecting a fee for Callacher. "Glentoran has no interest in keeping any player who does not want to be part of the manager's rebuilding programme," said a statement from the club. "Jimmy is free to join any club willing to meet our valuation of the player. "If he does not leave the club in January Glentoran will be due a considerable development fee at the end of the season. "Either way the player will categorically not leave Glentoran on the cheap. Nor will he play again for Glentoran." The East Belfast club lost Sean Ward and Andrew Waterworth to their big cross-city rivals in the summer, after picking up the Irish Cup in May.